After many years of reading about it in magazines and watching the highlights on YouTube, at long last I got to experience the world’s greatest motor show for myself: the Geneva International Motor Show 2018. A short bus ride from Geneva Airport takes you to Palexpo where this annual event is held. Here’ll you’ll find six huge halls filled with a collection of the weird and wonderful that the world’s manufacturers and designers have assembled for our delectation. As well as being an opportunity for many of the recognised car brands from across the world to show off their latest models, many brands like to unveil their design concepts, which often provide just a hint of what the future might hold. A common theme amongst these designs this year was alternative fuels and autonomous vehicles capable of transporting us in comfort and stress-free style. In addition to the many concept vehicles on show, there were a number of companies displaying luxury van interiors. These are the new limos, aimed at celebrities and the mega-wealthy who want to travel discreetly. From the outside, these vehicles look just like the plain vans we see on the road everyday (a black Mercedes van was the general trend), whilst inside it seems the owner can specific any luxurious comfort they wish. As usual at a motor show, there was a plethora of amazing hyper-cars (supercars are so last century!). Companies such as Zenvo, Hennessey, Corbellati, Koenigsegg, Rimac, Bugatti, McLaren, and Pagani displayed a glut of machines capable of doing well over national speed limits. Zenvo TSR-S – A Danish hyper-car that certainly looks the part! The Renault EZ-GO – Is this the Autonomous Uber of the future? 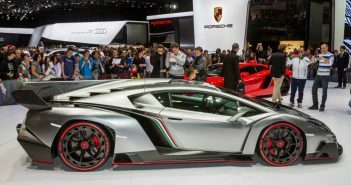 The Geneva International Motor Show is considered the best in the world and I can see why. See you next year!